Arguably the most important position in CFF, the RB spot has given us a plethora of impressive performances and massive letdowns over the past 10 years. Every pick is a gamble going into the season, but these RBs have been time-tested and paid off well for the lucky few who selected them. McWeapon’s Junior year wasn’t much of a jump from his 12 game, 1337 YDs sophomore season in 2015. Nevertheless, McNichols’ body control and ability to break college-level defenses (and an extra game) gave him a boost in 2016, helping him break 1500 YDs and enter the 2017 NFL Draft. Drafted in the 5th round, McNichols success never fully translated to the NFL, with a career 4 YDs for the Tennessee Titans. Despite this disappointing NFL transition, McNichols proved his worth for the Broncos in his impressive JR season. Etienne’s sophomore season wasn’t as statistically strong as some of the other players on this list, but few can compete with Etienne for Most Valuable season. Etienne was frequently the driving force to college football’s most dominant 2018 team. On the way to a National Championship, Etienne proved to all that he had developed the raw skills evident during his 823-yard freshman year. Etienne also reminded the CFF world of his explosiveness and ability to burst out of holes in the defense for big time runs. It is also important to note that Etienne ranks 25th in total attempts, with only 204 (the average of all listed players is 308). 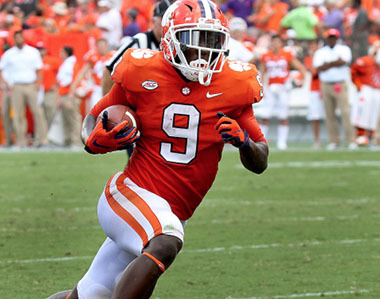 Following his National Championship and 7th Place Heisman voting season, Etienne should remain a top-10 target for CFB backs in 2019 college fantasy football rankings. Bernard Pierce was one of the most capable players in CFB when he was able to be on the field. An impressive freshman season, highlighted by 1,361 YDs, was followed by an injury cutting his sophomore season to only 9 games. Despite this setback, Pierce had an impressive junior season, leading Temple to a 9-4 record despite having a brand new coaching staff. His college success didn’t translate into his short NFL career as the backup to Ray Rice, where he battled a hamstring injury and a series of off-field misconduct issues. Nonetheless, Pierce dazzled crowds with his athletic play style and elite speed, helping him to a 310.1 Fantasy Point season. Montee Ball is the only repeat player on this list, which is bizarre, considering this is his senior season. In his senior season, Ball led a 8-6 Badgers team and captured the Doak Walker RB Award, becoming only the 2nd Wisconsin player to win the award. Despite dropping in every statistical category from his junior season, Ball still dominated the RB game during the 2012 season and gave CFF players a bushel of points with 315. No doubt about it, Pumphrey is easily one of college fantasy football’s best players in its history. 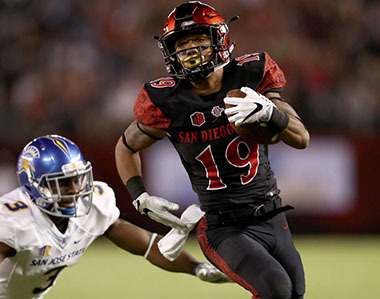 Pumphrey holds the record for all-time rushing yards, and was the catalyst behind putting SDSU on the map. Despite an elite college rushing career, Pumphrey’s injury troubles have slowed his entrance into the NFL. He plans on a return soon, but Pumphrey’s college career is enough of a legacy to keep him around for years. The only reason Pumphrey, who ranks 6th on this list in yards, has dropped to 21 is his low number of TDs, ranking 24th on this list with 17. Regardless of his TD count, Pumphrey was a high-quality running back who couldn’t be stopped by opposing defenses and plagued opposing CFF teams. If anyone can break the Donnel Pumphrey record we just discussed, it’s going to be Jonathan Taylor. In just 2 seasons at Wisconsin, Taylor has already received a Doak Taylor Award and racked up 4,171 YDs. Because he wasn’t redshirted, Taylor is also ineligible for the 2019 Draft and will return to Wisconsin for a 3rd season. 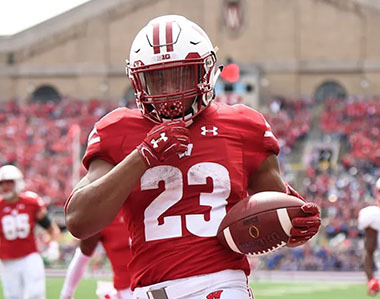 If he replicated his 2018 rushing yards, he would be in 2nd place for all-time yards (including Bowl Games) as a JUNIOR, passing former Badger Ron Dayne. The only reason Taylor’s incredible season (4th on the list in yards) has dropped to the 20 spot is his list-worst 16 TDs this season. Despite being a low TD producer, Taylor’s ceiling and record-breaking potential make him an easy high-pick for 2019 CFF. Hill’s impact on Wyoming football was clearly evident in his 3 years with the team. 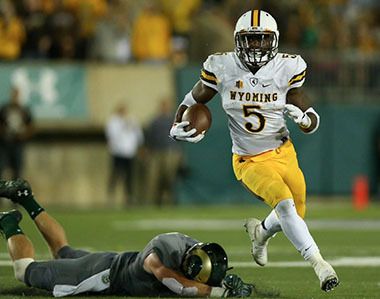 An impressive 1,860 yards plus a team-high 22 TDs his JR year excited both Wyoming fans and lucky CFF players. Hill’s high-IQ running mixed with his 6’1” build and elite strength made him a threat anywhere near the red zone. Although Hill’s abilities haven’t fully shown in his NFL role, he has the potential, running for 115 yards in Week 16 of the 2018 season. 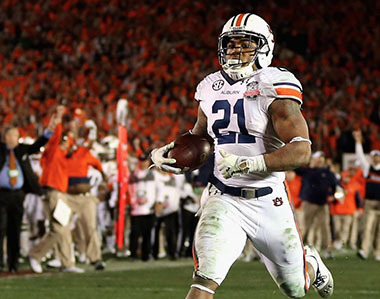 It’s hard to have a championship team without someone elite scoring points, and Tre Mason was the guy for Auburn in their runner-up season in 2013. Mason comfortably led the Tigers in scoring and overall yardage during their SEC Championship season. Mason has yet to find success in the NFL after being released from the Rams following a dramatic summer of legal issues and miscommunications. Mason’s impact on CFF was significant too, with his 23 TDs providing a good scoring boost for teams who needed a strong scoring RB. Although he’s lost relevance in modern day, Mason’s impact on Auburn and the college level earns him a well-deserved spot on our list. NFL Experience: 3 seasons, 2 Pro Bowls, 1 First Team All-Pro, currently with Dallas Cowboys. 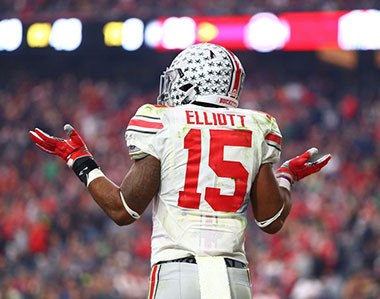 Accumulating almost 4,000 rushing yards in his time at Ohio State, Elliott proved to be the perfect NFL-caliber RB. A heavy-set back with good speed and mobility, Elliott was the cornerstone of the 12-1 Buckeyes whose only loss was against Michigan State in the Big Ten Tournament. Being the first player on this list (to this point) to have experienced large-scale NFL success, Elliott has proven to be a strong CFF and traditional FF pick-up. A well-coached team and an explosive RB, Elliott’s junior year was a win-win for Ohio State and CFF players. This season, Henderson has made his case as the best CFF RB of 2018. One of the most explosive players in his class, Henderson proved that he was worth the hype last season. Sadly for CFF players, Henderson’s dominant seasons have officially come to a close after Henderson declared for the 2019 NFL Draft. Henderson provided a strong option from a traditionally basketball-based school. Henderson showed out last season and hopefully will find touches in the NFL. 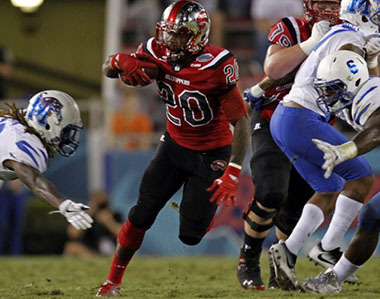 An underrated player, Wales showed his talents as a RB in a major way during his time at Western Kentucky University. Wales never logged a 10 TD season in his first 3 seasons as a Hilltopper, a stat that quickly changed in his senior season. Wales being ranked 15th is in no part due to his 24th ranked YDs, it is all because of his 9th ranked TD count. Wales’ uncanny ability to get into the endzone made him one of 2016’s best pickups. Although Wales’ hasn’t transferred his TDs to any professional league, his high volume college career has cemented him as one of the best RBs of this decade. 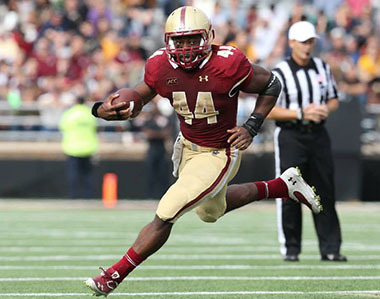 Andre Williams was the Boston College machine that helped an underwhelming 7-6 Eagles team compete at a high level. Williams was one of the best RBs at reading defenses, never struggling to find an open space to dash through. Because of this, Williams was able to churn out over 2000 yards during his senior year, despite never having more than 600 yards in any season prior. Although he ranks 4th in attempts on this list, Williams still showed his prowess for picking apart secondaries and getting long runs, leading to his fantastic season. CFF owners who bought high on Bryce Love this season may have been disappointed at his usage and stat line, with his touches being halved due to nagging injuries resulting in Love not quite hitting 800 yards. 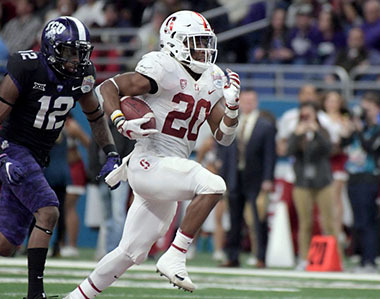 Nevertheless, Bryce Love’s fantastic junior season explains why CFF owners would go that high for him. Love was easily 2017’s fastest running back, leading the Cardinals to a 9-5 season and an AP Poll 20th Ranked finish. Love’s quickness and efficiency made him unstoppable in 2017. But only time will tell if those same traits will find him success in the NFL as he tests the draft waters in 2019. Fournette has proven to be a generational talent with immediate success (barring injury) in the NFL. Fournette’s mixture of speed and strength translated well to the league, but proved to be even more of a problem for college-level defenses. His sophomore season saw his greatest statistical numbers, almost cracking 2000 yards (ranked 8th) and 22 TDs (ranked 18th), all while playing a list-low 12 games. 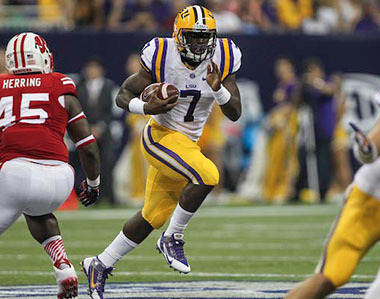 Fournette’s impressive sophomore season was an uplifting moment for a strong LSU team. Although his production decreased in his junior year, Fournette still served as a solid option for CFF players in need of a star RB. Carey’s showing at Arizona was impressive. The Wildcats football success is in large part due to Carey, and CFF owners benefitted as well. With a statistical stronghold in both categories, Carey knew how to put points on the board for both Arizona and CFF owners alike. Carey’s relentless finishing and explosive speed secured his spot as one of the best college RBs in recent history. As far as top 10 running backs go, Jefferson easily fits into this list. Jefferson’s standout junior year may have been slightly lackluster in yardage compared to the others on this list, but a stronger 24 TD performance gives him the boost into the top 10. 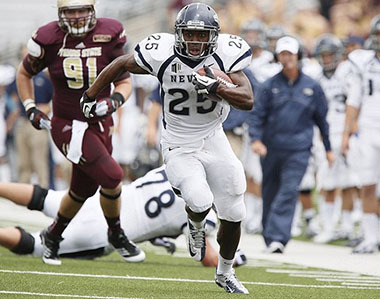 Although Jefferson’s ability to explode out of gaps and find the endzone never really catapulted the poorly coached Wolf Pack to a dominant season, Jefferson still managed to have one of NCAA’s best rushing seasons as an individual. Jefferson finished his 3rd year as a Doak Walker Semifinalist and scored 7 TDs in a game against Hawai’i. Jefferson may have never seen a NFL field, but his strong college season was all he needed in the eyes of his CFF owners. Similar to Stefphon Jefferson (#10), James Conner’s strong sophomore season wasn’t because of a freaky amount of yards, it was because of a 26 TD season that cemented his place as one of the greatest to run in the 21st century. 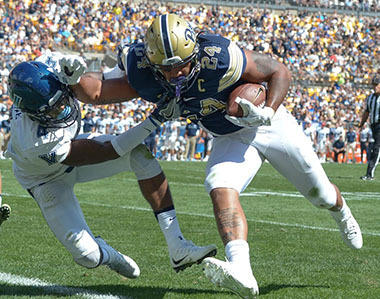 Conner’s ability to take contact gave him an advantage as the ACC Player of the Year, despite Pitt’s slow 6-7 season. Conner couldn’t repeat in the following seasons due to an MCL Sprain and cancer scare, but he has since recovered and began to show his talents in the NFL as a Pro-Bowl RB last season. Although his jersey now says Steelers, Conner is still tearing it up in the Steel City like he did in college. Although Ajayi may be one of Fantasy Football’s most agitating players due to his proneness to injury, his college years can be described as anything BUT agitating for CFF owners. 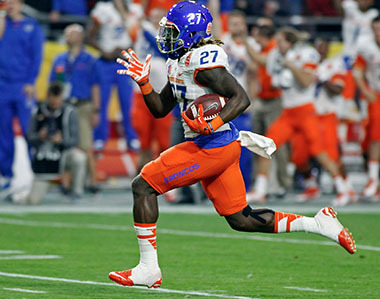 In fact, a healthy Ajayi managed to lead the Broncos to a 12-2 season where they finished ranked 16 by the AP Poll. Ajayi was the shiftiest RB in the Mountain West during his 3rd and final season as a Bronco, where he displayed his mixture of elite speed and strength. These components worked in Ajayi and CFF owner’s favors, especially considering his impressive 28 TD season (T-5th on this list), giving him a 17.8 FP lead over James Conner. 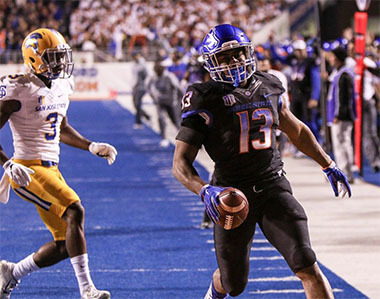 Ajayi, currently battling injuries once more, can only hope that his post-injury return can bring him back to the “J-Train” days at Boise State. 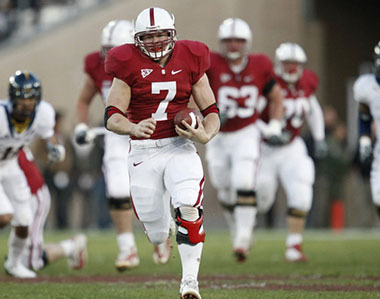 Gerhart’s senior season was easily the most memorable and record breaking season in Stanford history. Gerhart’s yards record was unbeaten until 2015, when Christian McCaffrey passed him, and his Doak Walker Award and Heisman Runner-Up broke records for the Cardinals as well. An excellent rusher in small spaces, Gerhart’s physical frame proved to be a CFF players dream. Gerhart struggled to translate this ability to the NFL, but his college days will long be remembered by grateful CFF owners. The best part about Kapri Bibbs big season in 2013 was that it was completely unexpected. Bibbs formerly ran for Front Range Community College, the largest community college in Colorado, before transferring as a sophomore to CSU. 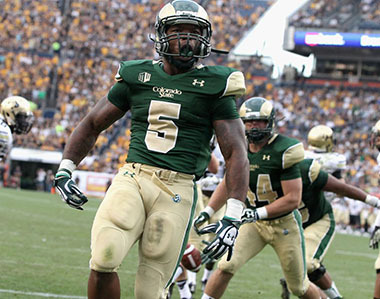 Suddenly, seemingly out of nowhere, Kapri Bibbs became Colorado State’s most impressive college athlete. In his only season as a Ram, Bibbs rushed for a school-high 1,741 YDs (ranked only 23rd on this list, however) and 31 TDs (ranked 3rd on this list), joining Barry Sanders and Montee Ball as the only players in history to have 30 rushing touchdowns in a season (now joined by Devin Singletary). Bibbs impressive performances never developed in the NFL, but Bibbs’ magnificent sophomore season easily earned “The Wild Thing” a spot in our top 10. People knew Rashaad Penny was good. He broke 1000 yards in his junior year and provided the Aztecs with most of their offense. But his senior season was something special. Despite a lower caliber TD season (T-15th on the list), Penny’s 2,248 YD explosion (2nd on the list) provided CFF owners with a jolt of energy and an influx of points. 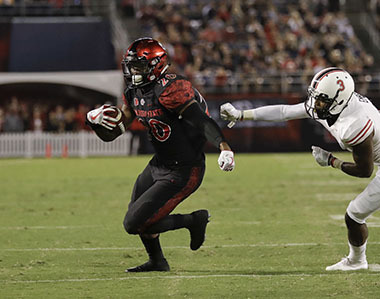 Rashaad Penny’s explosiveness and speed made him an unstoppable force at SDSU, leading to his D1-best yards season. Penny was then selected in the first round of the 2018 NFL Draft by the Seattle Seahawks. As a rookie, Penny came off the bench for Seattle, but still managed to have a solid 419 yard season as he flashed his potential. Penny was one of SDSU’s best and one of the NCAA’s best in 2017. As far as dominant seasons go, Devin Singletary’s historic sophomore year fits the description. 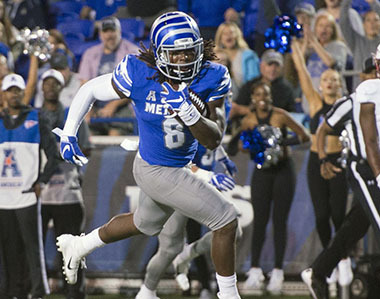 He led all of D1 in rushing touchdowns and overall touchdowns, was a Doak Walker Award Semifinalist, and led a relatively unknown Owls team to a 11-3 record as well as a C-USA Championship. A raw talent RB with great speed, good build, and the ability to burst out of gaps, Singletary’s years at FAU have put the Owls on the college football map. 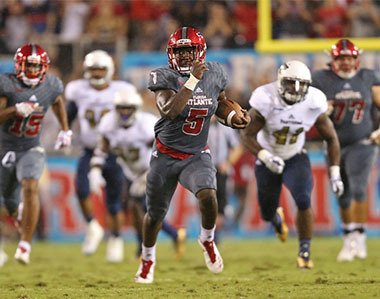 In 3 seasons, Singletary ran for 4,278 YDs and 66 TDs, both school records at FAU. Now, Singletary hopes to test his hand at the 2019 NFL Draft. If Singletary can continue to show his explosiveness and scoring ability, he should have no problem adapting to the highest level of football. His numbers may rank 3rd on this list, but Derrick Henry’s years at Alabama would easily rank 1st in popularity and memorability. The strong back from Alabama left his mark on college football during Alabama’s 2015 Championship season. 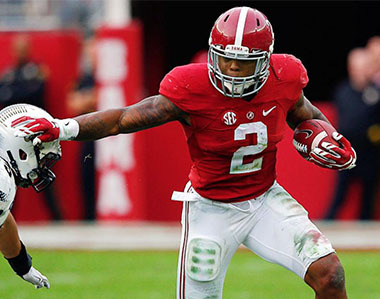 Henry ran for an insane 2,219 YDs (3rd on the list) and 28 TDs (T-5th on the list), all while sharing the field with notable NFL-caliber scorers like Kenyan Drake and Calvin Ridley. Henry’s combination of strength, body control, and speed helped him on his path to becoming a Doak Walker Award Winner, a Maxwell Award Winner, a Walter Camp Award Winner, and a Heisman Trophy Winner all in one season. Henry has also begun to breakout in the NFL, rushing for 1,059 YDs last season on the Titans. Henry’s college career may have been fantastic, but he is only getting started on his dominant football career. 20 spots later, Ball reappears as the only player to make this list multiple times. One year before his 20th ranked season, Ball broke records with one of the most memorable RB seasons in NCAA history. His 39 total touchdowns, 33 rushing, tied Barry Sanders for the most in a single season in CFB history. Ball also finished 4th in Heisman Voting along with teammate Russell Wilson who finished 9th. Ball, one of the quickest RBs in NCAA history, led the Badgers to a Big 10 Championship and a berth in the Rose Bowl, where they lost to Oregon, 38-45. Ball passed legendary Wisconsin RB Ron Dayne in touchdowns, both rushing and all purpose, to secure his spot as a Wisconsin and NCAA legend. 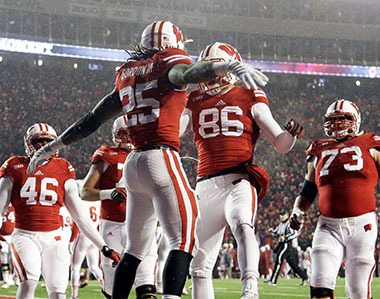 There’s a reason Gordon was called “The Rushing King” during his junior year as a Badger. Gordon ran for a jaw-dropping 2,587 YDs, 339 YDs more than any other player on this list, as well as 29 TDs. Gordon’s 2,587 YDs also ended with him at 2nd Place in all-time single-season rushing yards, right behind Barry Sanders’ 2,628 YDs. Gordon’s impressive season gains another level considering that he shared the backfield with Corey Clement, a strong RB who made his way to the NFL as well. Gordon’s game was very well developed in his Doak Walker Award Winning season, showing his combination of speed and solid build as well as his long strides. With virtually no competition, Gordon’s insane junior season gives him the #1 spot on our list and arguably a top-3 all-time RB season spot.